Since Apple released swift as an open source language, there’s been various discussions going on making use of its openness, especially In the field backend services. Why backend web services? As a iOS Developer, we would be pretty comfortable using the same language and logic that can be used for apps as well as backend. When we came to know, swift language has been announced as Open source. The first thing which came to our team mind was, Is It possible to create web applications and backend web services using swift language. From there we started exploring various Apple community and forum sites. The “Swift Express” Is the one framework, which we thought very easy to use, due to its perfect documentation and we thought of giving a try on this new framework. 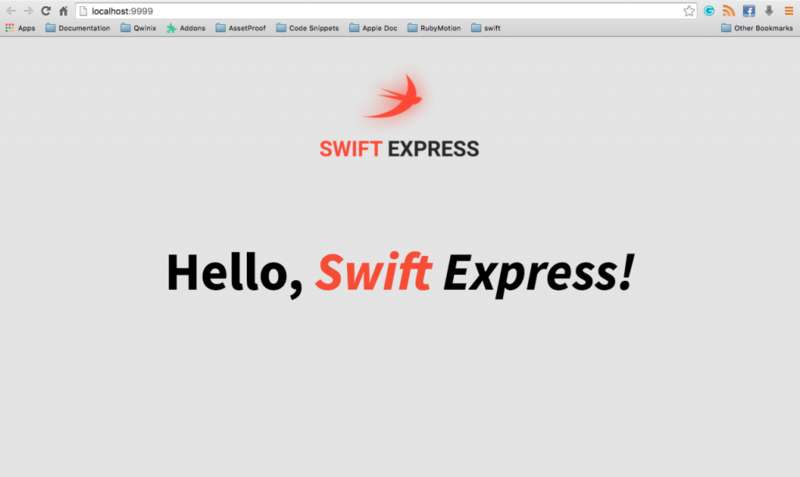 The swift-express webserver project developed and run by CrossLabs. Swift-Express frameworks inherited the features of Play Framework and Express.js. Play framework: High-productivity Java and Scala web application framework that integrates the components and APIs needed for web application development. Express.js :Express is a minimal and flexible Node.js a web application framework that provides a robust set of features for web and mobile applications. You need to have Xcode 7.2 or newer version. First you need to Install HomeBrew In your machine. Next, Open your terminal and type the following commands. In your terminal, type the following command to create a project In any our destination path and once project Is created go to the folder. 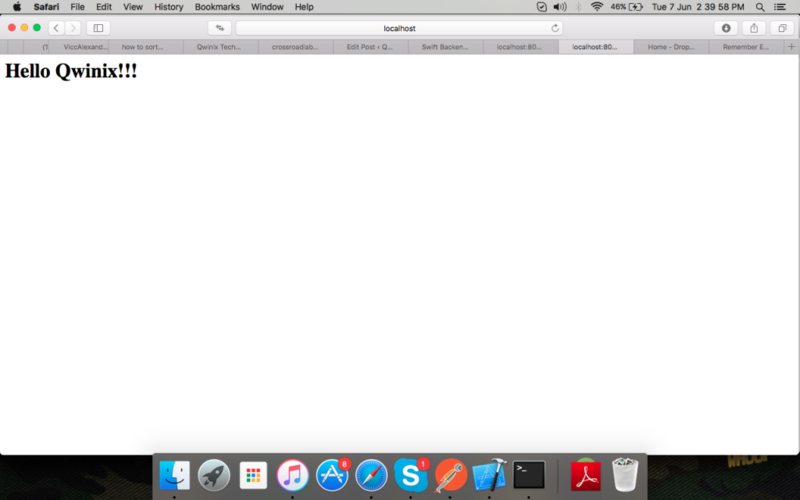 Next type "swift-express bootstrap". This command will download or update all the dependencies files Into the project. Once the build succeeds, Open the project. As soon as Xcode opens your project, go to main.swift and notice we already have all the necessary code we need in there in order to start the server. Our project will be running In the localhost port number: 8080. If everything went well, you should see following response on your browser. Now,test it in the browser at localhost:8080/hello?message=Hello.You should see a white screen with Hello written on it, or whatever string you choose to put after the = character in the URL. Now our local server setup is complete. Lets a write a simple SignUp API for user registration using Swift-Express. if firstName.characters.count < 1 || firstName.stringByReplacingOccurrencesOfString(" ", withString:"") == ""
if lastName.characters.count < 1 || lastName.stringByReplacingOccurrencesOfString(" ", withString:"") == ""
As we finished our signUp API.Lets test this API, by creating simple signup page app. Create a new project of Single view. Add four textfields and a button .Its should look somewhat below screenshot and make a necessary IBOulet and IBAction connection. Lets create "Network connection class" to make connect with our localhost and call this class has "GWebengine.swift",its a subclass of NSObject. 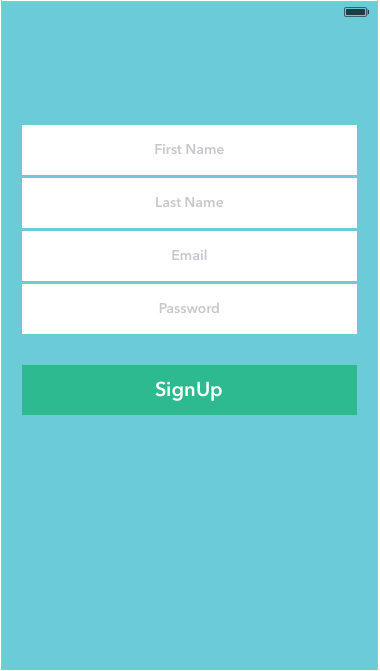 In ViewController, make a API call on the SignUp Button action. and add the necessary call back delegate methods In default ViewController class.